Many people think that a diagnosis for a doctor and note that puts them out of work is enough to win a Long Term Disability insurance claim. Although some diagnosed conditions are so obvious, an LTD insurance company may automatically pay a disability claim, most are not. Instead, what you want your doctors to do is to explain how your condition limits you in their medical records. 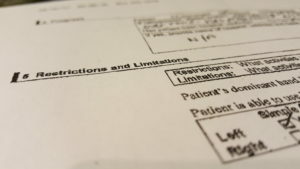 Some will and some won’t, but the more a doctor can explain what your “restrictions” and “limitations” are, the easier it will be for your Long Term Disability claim to be approved. Why? A diagnosed condition is just a label for a certain type of illness or injury. Alone, the diagnosis does not explain why you cannot work. Even a list of your symptoms coming from the diagnosed condition is not enough. You need an explanation of how the diagnosed condition (or conditions) causes the symptoms you have, and how those symptoms restrict and limit you. Symptoms are the way that a diagnosed condition reveals itself in your body. Pain, fatigue, lack of mental sharpness, dizziness, shortness of breath, and numbness are all examples of symptoms. Side effects from the medications you use to treat your condition are also symptoms. Alone, symptoms do not explain why you are unable to work. However, your symptoms are the reasons why you cannot do tasks like you did before your disability. Symptoms are what you experience that limit or prevent you from completing tasks the way you need to complete them in order to do all of your job. When you are “restricted” from doing something, that means you cannot do it. You are prevented from doing the task, because some symptoms (such as pain) keeps you from completing the activity. It may be movement (walking, lifting, pushing, etc. ), maintaining a position (sitting), or using your mental factulties (focusing) that you are totally restricted from by your symptoms, but when you are asked about your restrictions, think: what are you prevented from doing totally? Many disabled people have few restrictions. They may be able to do things for short periods of time or in lessened motions rather than being completely stopped from an activity. That is ok. That is where “limitations” come into play. being unable to stand on your feet for more than 15 minutes. Your limitations may be much more wide ranging than these few examples. When you make a disability claim, you need to think of every single limitation you have to help prove your claim. This is often where an experienced disability attorney can help you. Our training in analyzing medical records and understanding medical conditions and symptoms as they relate to disabling restrictions and limitations allows us to present a disabled person’s case in a way that explains their disability to the disability insurance company. You want as many references and explanations about your disabling restrictions and limitations as possible in the records that are sent to your Long Term Disability insurance company. Be sure to see your doctors regularly, and constantly explain not only your symptoms, but also how those symptoms restrict and limit you. Help your doctor understand why this information is important to record in the medical chart. You can also keep a regular journal which outlines details and examples of your restrictions and limitations. Some courts have found personal journals to be compelling evidence. In the end, how well you document your disability may determine whether your Disability Insurance company pays your claim. If you want to discuss your Long Term Disability Insurance claim with an experienced Bad Faith & Disability Insurance Attorney, call us toll-free at (866) 282-5260.